We’ve been working with Greener Growth to create a wildlife area at The Cadogan complete with wild flowers, apple and plum trees, pond, woodland walkway, compost bay, insect pyramid with a hedgehog box. In the kids play area, you will also find bug hotels and bird and bat boxes. 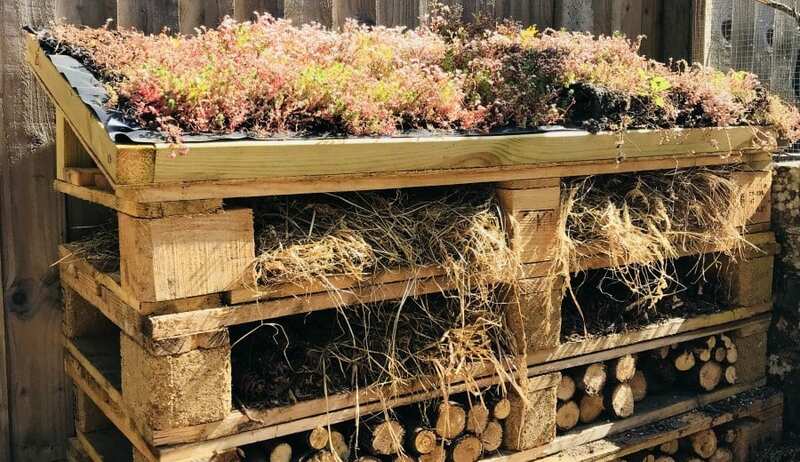 At The Crown, Greener Growth have also installed bug hotels, bird, bat and owl boxes and an insect pyramid with a hedgehog box. Later in the year, they will also be planting a number of heritage fruit trees and a living willow ‘fedge’ (part fence part hedge) along the perimeter of our garden. Our glassbuster was installed at The One Bull last week and all our empty bottles now travel down a chute from our bar into our lovely glassbuster to be crushed, compacted and then recycled. We’re hugely relieved to no longer have to put glass into our bins – less noise, more recycling, what’s not to love? We receive many boxes with deliveries in every week and will soon have a card and paper baler at The One Bull to compact our card and paper making it easier for us to recycle it. We’ve had a meeting with a potential supplier about installing an electric car charging point at The Cadogan for our guests and will be looking to drive this forward (sorry, couldn’t resist the pun!) shortly.